Enter up to 5 questions to ask the user. The default question will be a text field entry. If one of the question is for their email address, then check the email field so that if they choose to hit the email button after the survey, their address will be auto populated. If the question is a Yes/No, check this box and Yes/No buttons will be shown instead of a text field. Select a .txt file with the text of the disclaimer to be shown. 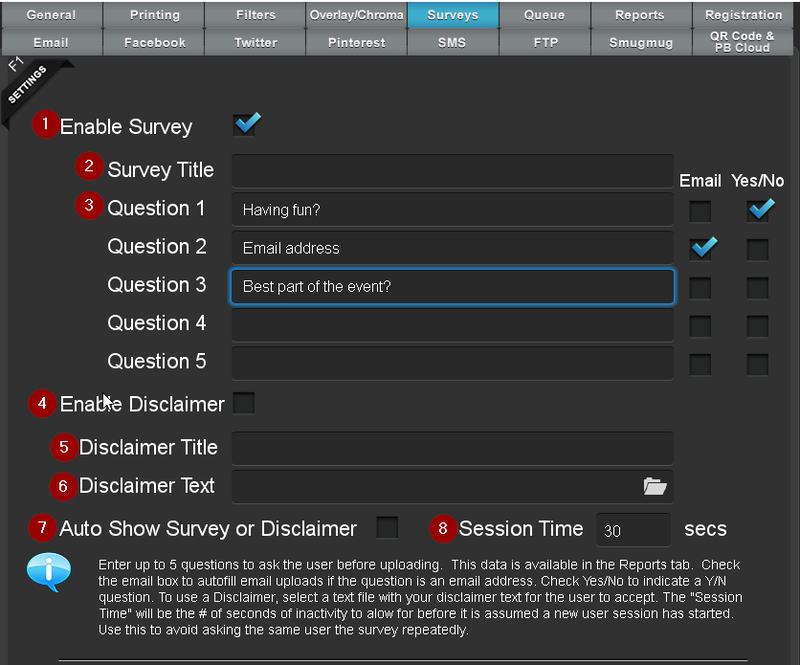 Checking this will show the survey or disclaimer as soon as the user selects a photo. Otherwise, it will show once the user has chosen one of the sharing buttons. This is used to help prevent the same user from being shown the disclaimer and survey if they have already answer them and have chosen to upload another photo. This value is the number a seconds that will define a "session" during which if the kiosk is idle, it will be assumed it is still the same user and the survey/disclaimer won't be shown on subsequent uploads.